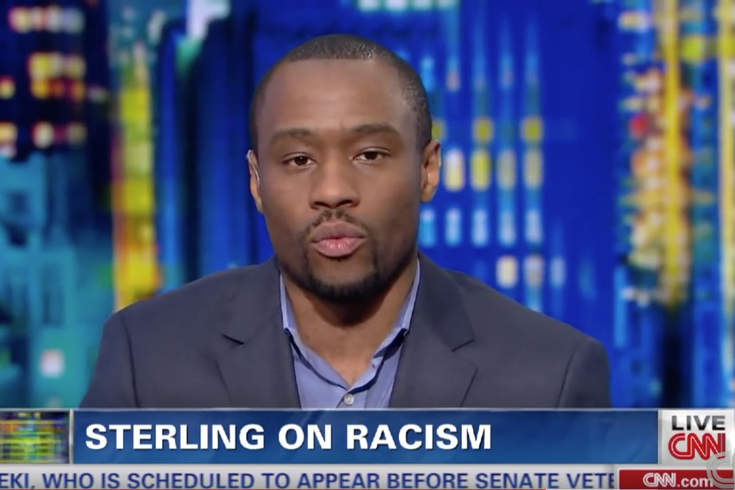 He is under fire because of comments about Palestine and Israel during a speech at the U.N.
Marc Lamont Hill, seen here discussing Donald Sterling on CNN in 2014. CNN has reportedly cut ties with Temple professor Marc Lamont Hill, who sometimes served as a political commentator on CNN shows, because of comments he made during a speech at the U.N.
A spokesperson for the channel told Mediaite that Hill is no longer under contract with CNN. Hill has been actively defending himself on Twitter in the last 24 hours after he came under fire for Wednesday's comments, which have been interpreted as anti-Semitic. Hill urged countries to support a “free Palestine from the river to the sea” during his speech. The phrase “for the river to the sea” is reportedly a phrase used by anti-Israel terror groups, including Hamas, according to Mediaite. Hill was previously a columnist and editor-at-large with the Philadelphia Daily News. Last year, Hill opened Uncle Bobbie’s, a coffee shop and community space, in Germantown.